A family tree prepared by Gladys Irene (Wren) Hart confirms that these people were ancestors of John Hart. Gladys recorded that George Mobbs was from Buckingham(shire) and that Betsy Withers was from Midlands(?). She indicated that their eldest daughter Mary Elizabeth married Stephan Hart in Maidstone. 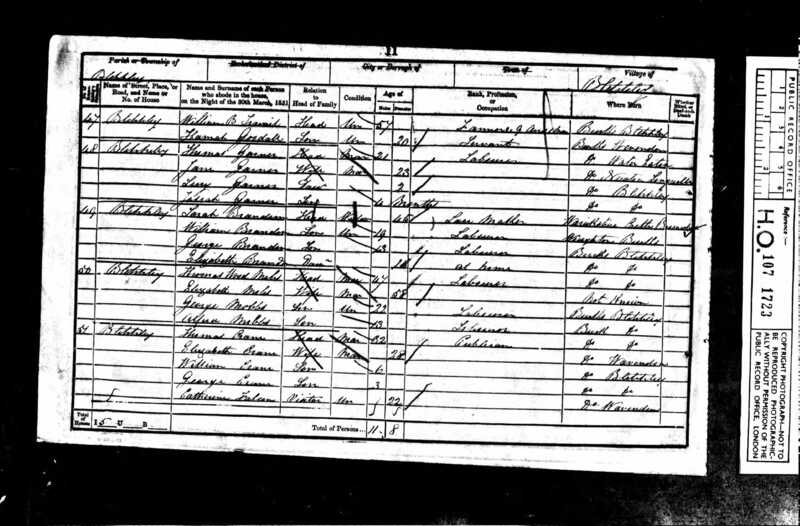 With this information we are able to positively find these people in the census entries of Maidstone in 1881. 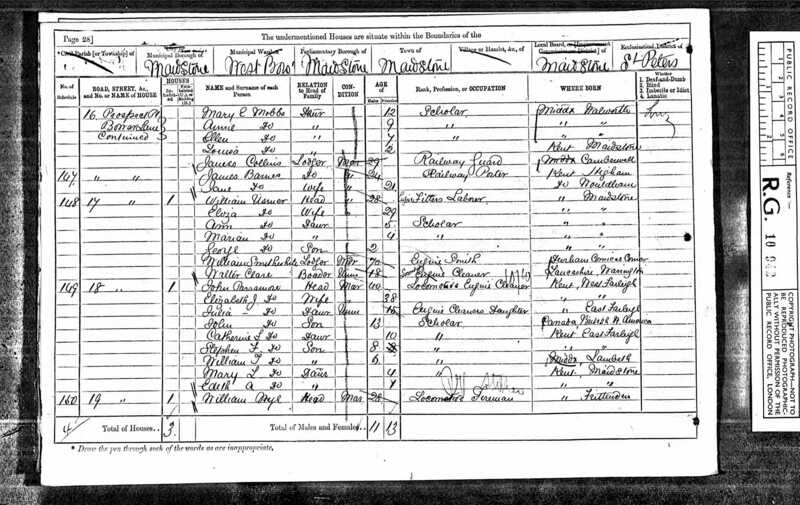 We first find George in the census of 1841 where he is a 12 year old child living with his parents, Thomas and Elizabeth Mobbs. The father is a 55 year old agricultural labourer and the mother is 15 years younger at age 40. 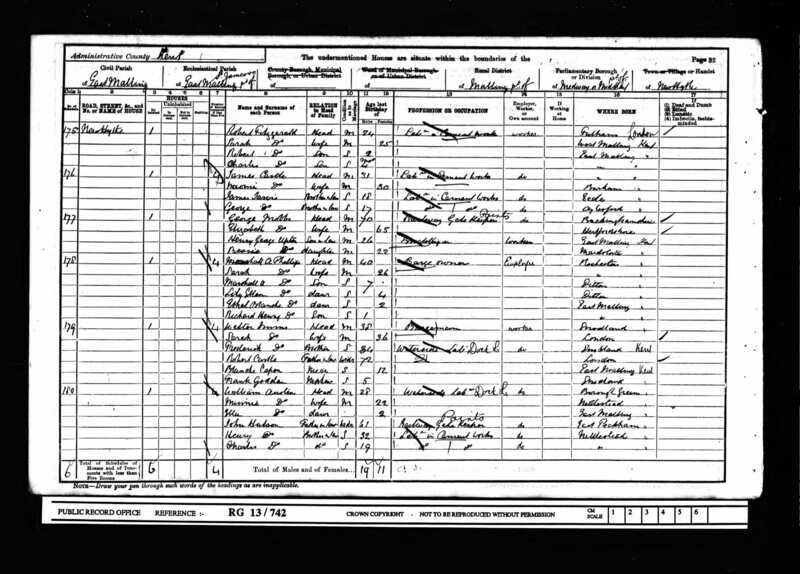 George is one of six children listed in the census return; he has four brothers (one older) and a sister. 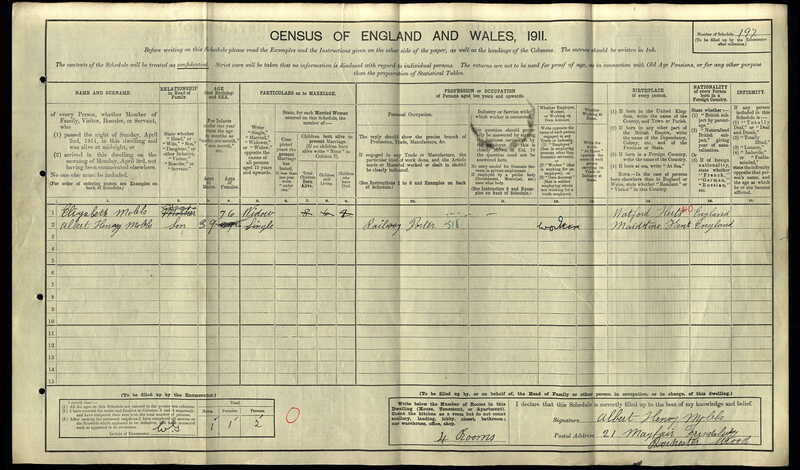 Elizabeth appears in the 1851 census of England as a 15 year old child living with her parents Emma and George. She is the oldest child living with the family at that time, although the fact that her mother, Emma, is 34 and her father, George, 39, suggests that there may have been older children in the family. It is interesting to note that her father, George, is a printer born in Middlesex, St. Johns Westminister. The children, including Elizabeth, are indicated as being scholars -- they were at school, which is again interesting as it indicates the family were literate and concerned about the education of their children, decades before general education was the norm in England. 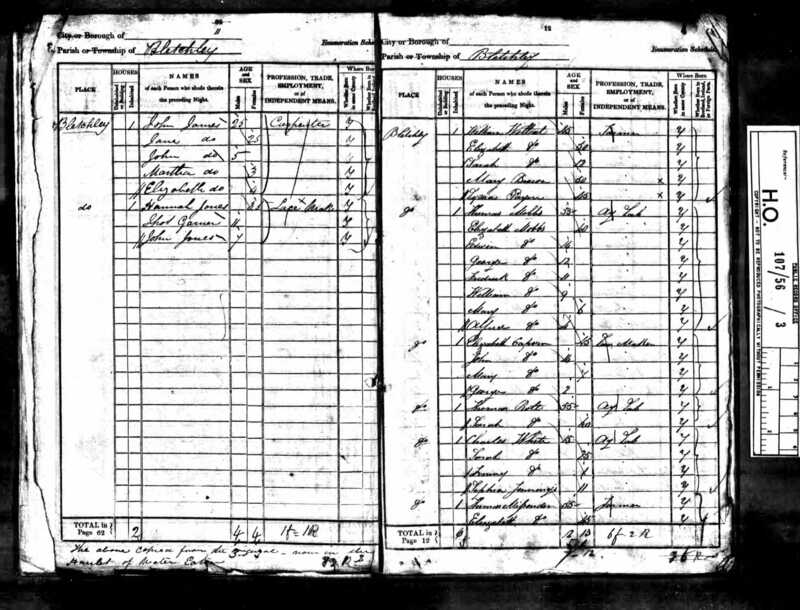 As the BMD entry shows there are two females with the name Elizabeth on this page; we can be sure that it is Betsy Withers due to the family records passed down by Gladys (Wren) Hart. We do not yet have the actual marriage registration for this union. 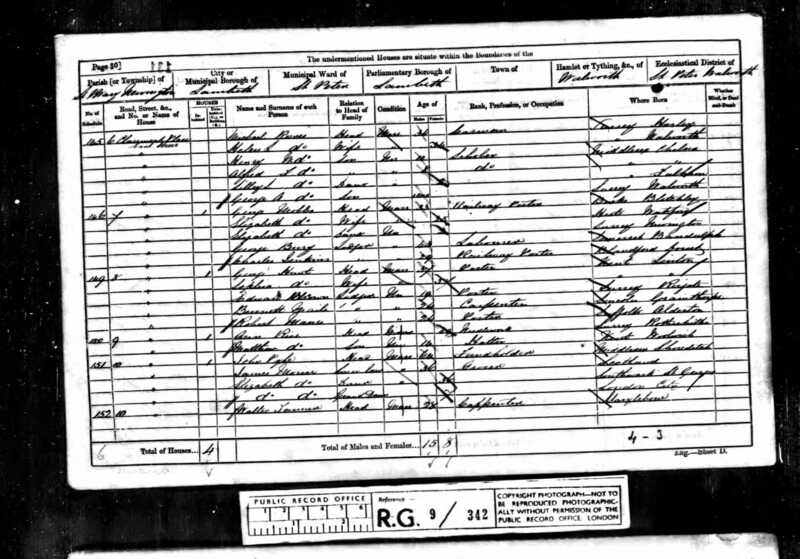 From the census records below we see that George and Elizabeth, although born in the Bletchley area, they were married in London. It appears that George, though starting life as a general labourer was able to gain employment as a labourer on the railway. This led to moving to Maidstone (which had signficant railway works) in the same capacity and to later employment as a railway guard and porter in Malling which is near Maidstone. 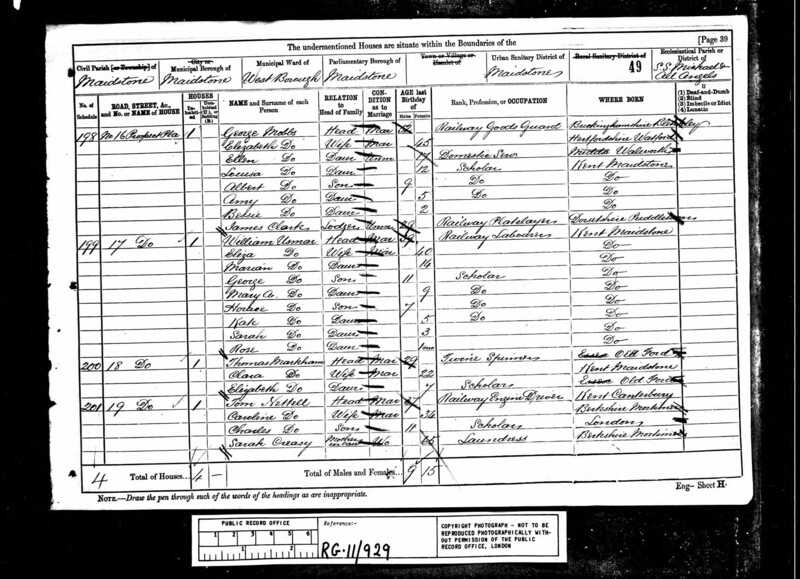 George appears in all the census records from 1841 through 1901 (he died in 1906) and from these we are able to trace his movements, his family composition and the work that he did during his lifetime, as narrated above. The family located at 16 Prospect St. is next door to the Thomas Hart household at 15 Prospect St. Although the daughter Mary Elizabeth (who was almost 23 years old by this time) is not living with the family, the information on George Mobbs and his wife Elizabeth (Betsy) corresponds. 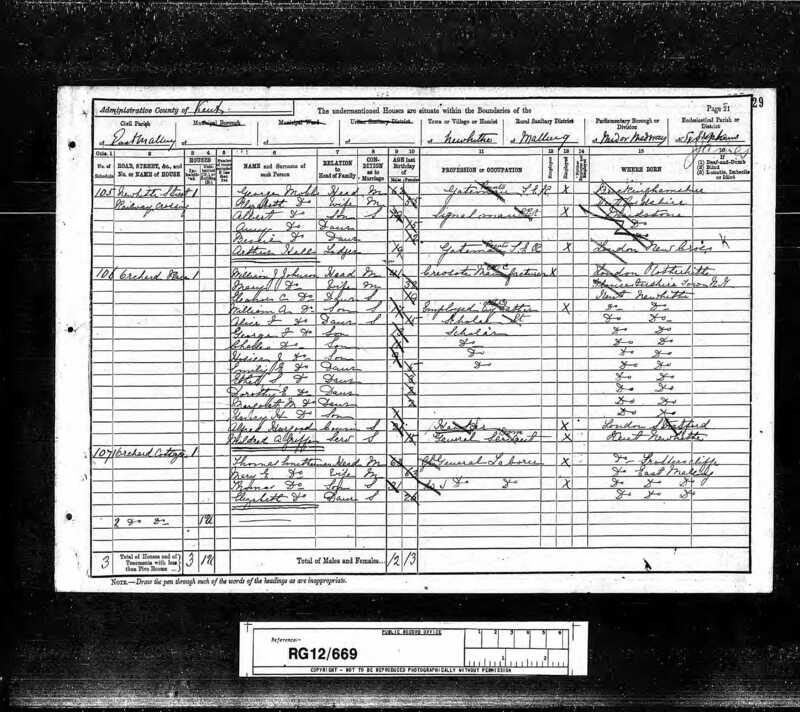 The information "Midlands" for Betsy's birthplace is obviously a mistaken interpretation for the actual birthplace in Walworth, Middlesex which was the birthplace of Ellen and probably of her older sister Mary Elizabeth. In fact, Betsy (nee Withers) was born in Watford, Herts, on the northwest edge of the London area. Both George and Elizabeth were born before the central registration system of 1837 so we have no possibility of birth registrations for them. 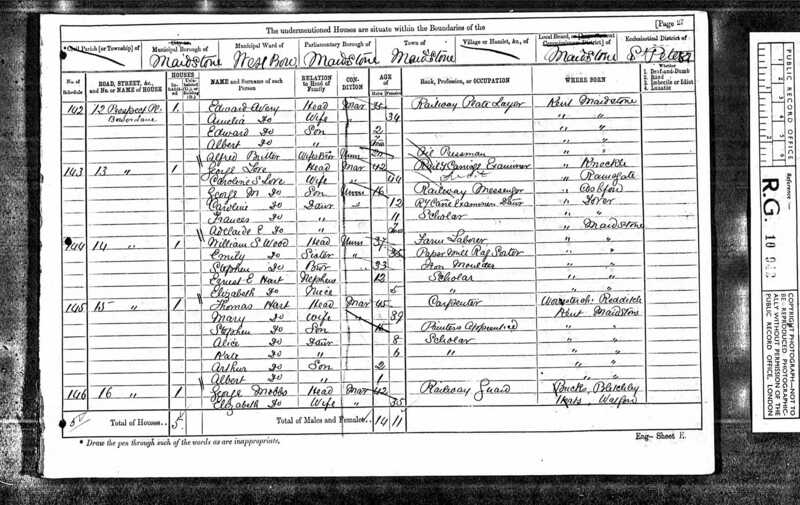 From the census we have the names of the parents but not the maiden name of the mothers. Indeed the maiden name of Elizabeth is known to us with certaintly (at least initially) from the genealogical notes left by Gladys Irene (Wren) Hart. The marriage record of George and Elizabeth would be obtainable (fairly easily but at a cost of several pounds) from the information provided by FreeBMD.